P2299 code - The brake pedal is attached to the booster push rod. When the pedal is depressed, the primary booster push rod is depressed which moves the booster secondary rod. The booster secondary rod depresses the master cylinder piston. The Powertrain Control Module (PCM) detects a brake application with the APP sensor showing a fixed pedal opening, temporary or permanent. Internally the PCM will reduce throttle opening below driver demand. Default action the ETC ligh illuminate. 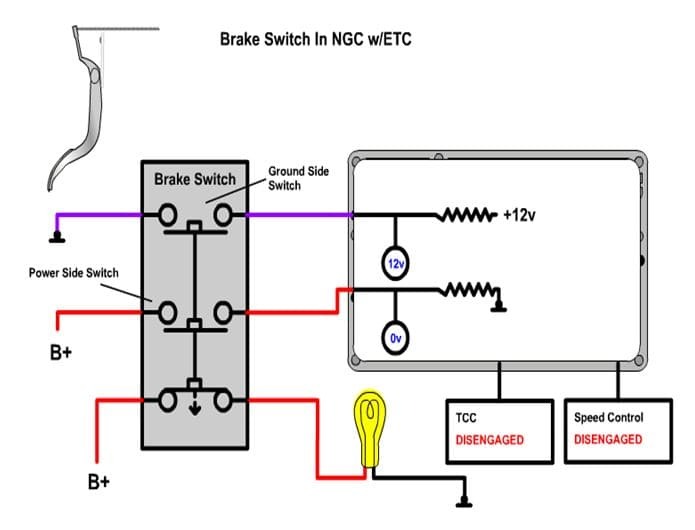 If a pedal assembly becomes mechanically stuck the voltage output will stay fixed, if this is also followed by a long application of the brakes this code will set. When this code sets the pedal position in the PCM software will ramp to idle. 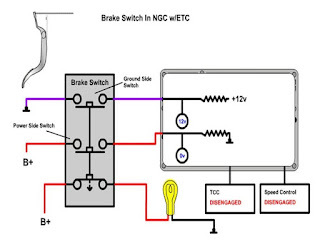 If the pedal voltage changes of the brake is released, the pedal position in the PCM software will ramp up to the pedal position and the ETC light will go out. With the scan tool, read DTCs and record the related freze frame data. The most likely cause of this DTC is caused by the customer driving with on the accelerator pedal and the other resting on the brake pedal. Ask the driver of the vehicle if these conditions apply to their driving habits. Are the listed conditions part of the customers driving habits? Yes, advise the customer of what caused the DTC. This is normal operation of a ETC equipped vehicle because of safety issues. With the scan tool, read the status of both brake switchs while pressing and releasing the brake pedal. Does the scan tool display the pressed and released while pressing and releasing the pedal? No, check the brake switch for proper installation and adjusment. Check the related circuits for opens and shorts using the appropriate wiring diagram. If no problems are found, replace the brake switch. Check for any obstruction that may hod the accelerator pedal partially pressed. Turn the ignition on, with the scan tool monitor both APP sensor voltage readings. Slowly press the accelerator pedal from idle until it reaches the end stop near the floor. APP sensor 1 voltage should start at approximately 0.45 volts and increase to approximately 4.6 volts with a smooth transition. APP sensor 2 voltage should start at approximately 0.22 volts and increase to approximately 2.31 volts with a smooth transition. Does the voltage for the appropriate sensor follow the list specification? Yes, perform the perform the PCM intermittent condition. No, check the signal and return circuits for opens and shorts. If no problems are found, replace the APP sensor. After installation is complete, with a scan tool select the ETC RELEARN function to relearn the APP sensor values. 0 Response to "P2299 Brake Pedal Position/Accelerator Pedal Position Incompatible"